Hey friends! I got really great feedback from my last recipe post so here I am again with another delicious recipe! 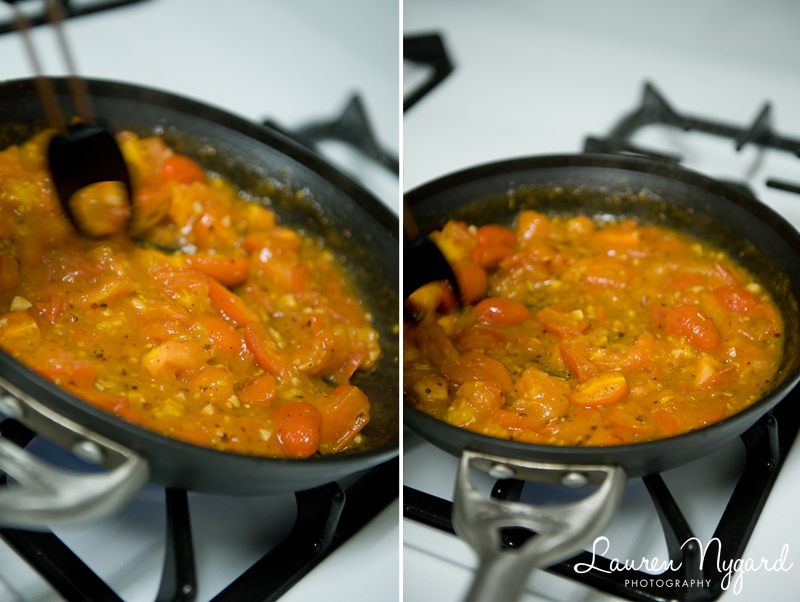 Though not vegetarian, this one is really easy and amazingly tasty! I was perusing Pinterest the other day when I came across a pin featuring this post on Design Sponge. I was running low on insulin with no refill for a couple days, so I had already informed my husband that I was going to require a low-carb diet to make it until the pharmacy had my insulin ready. And, I’ve been testing hubby’s squash tolerance recently. Though I love all squash, he’s not such a fan and has said yes to spaghetti squash, but no to acorn squash. Mental note. So, back to the recipe. 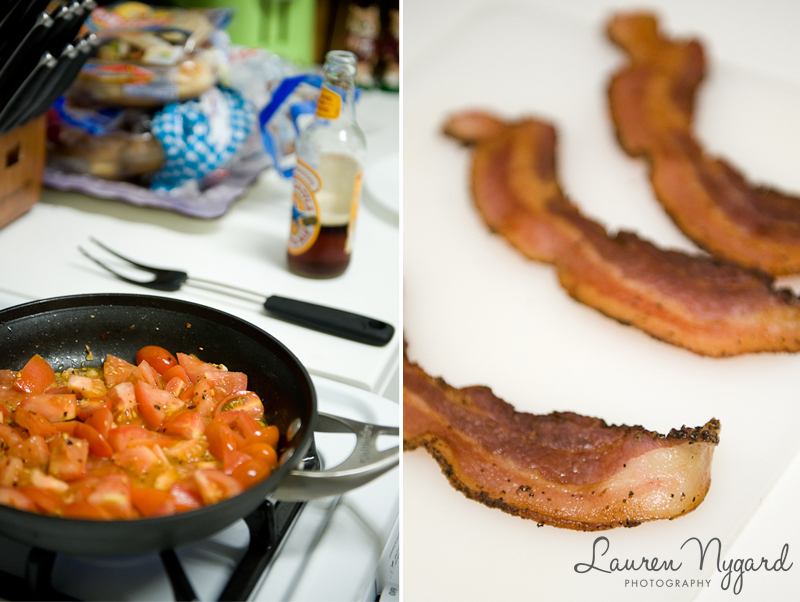 I see it online and realize it combines two of hubby’s favorite things: garlic and bacon. AND it also combines two of my favorites: tomatoes and rosemary. Well, since I’m on a low-carb kick, I think to myself that we could just sub spaghetti squash for the real pasta and we might have a winner! Ding ding ding! The best part? We had almost all of the ingredients in our kitchen already! YES! Cook the spaghetti squash. 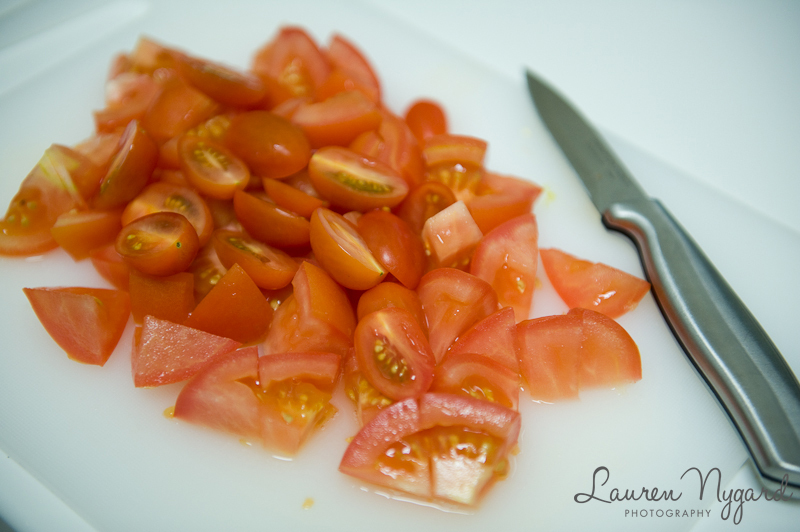 I cut it in half lengthwise, then place it (cut-side down) in a baking dish and add about a half-inch of water. Bake at 350 degrees for an hour or until the flesh is soft (but still a little crunchy). 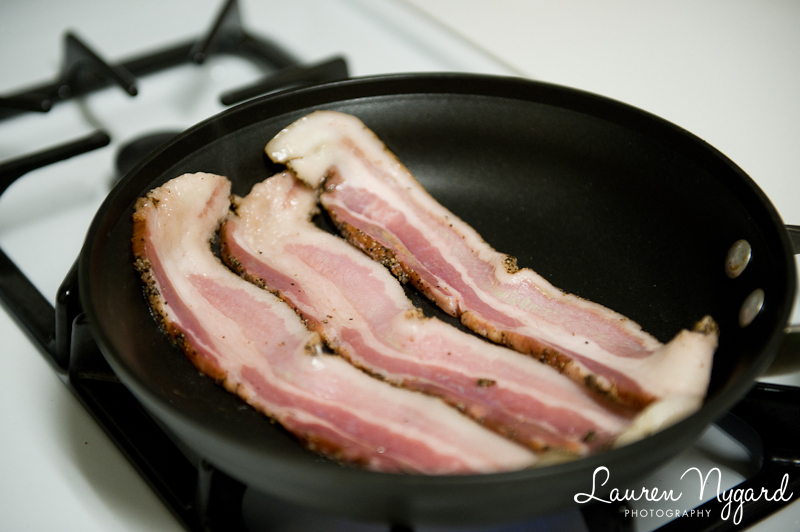 In about the last 10 minutes of cooking, place the bacon in a skillet on the stove and cook it up. Mince the garlic. Or have your husband do it for you. Ask him about the prison tattoo he has on his index finger. Don’t believe him when he says it’s really just a Sharpie marker. 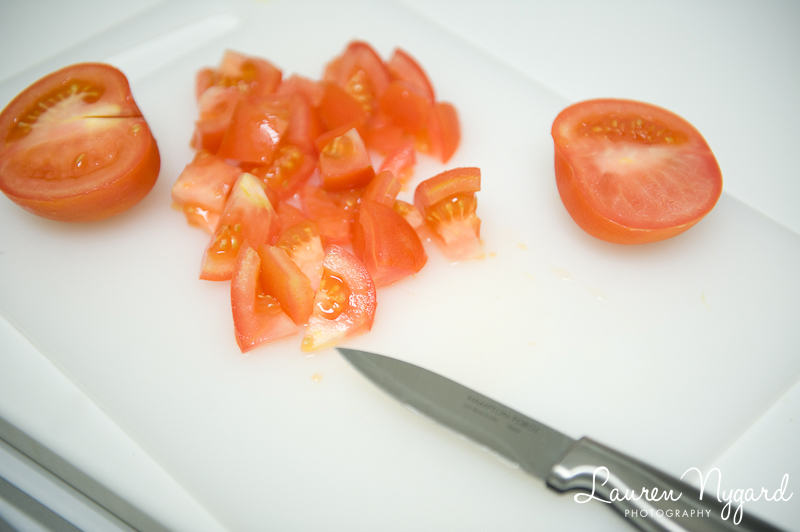 Halve the cherry tomatoes and add them to the tomato pile. Make sure the bacon isn’t burning. Remove it from the pan when it’s done and set aside. Discard most of the bacon grease, but leave enough to cover the bottom of the skillet and ensure that the garlic won’t burn. 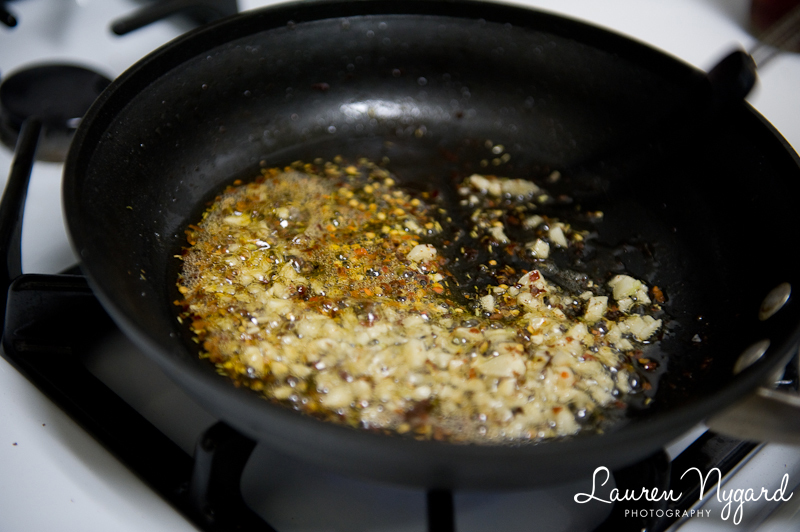 Then add the rosemary, garlic, red pepper, salt and pepper to the skillet. 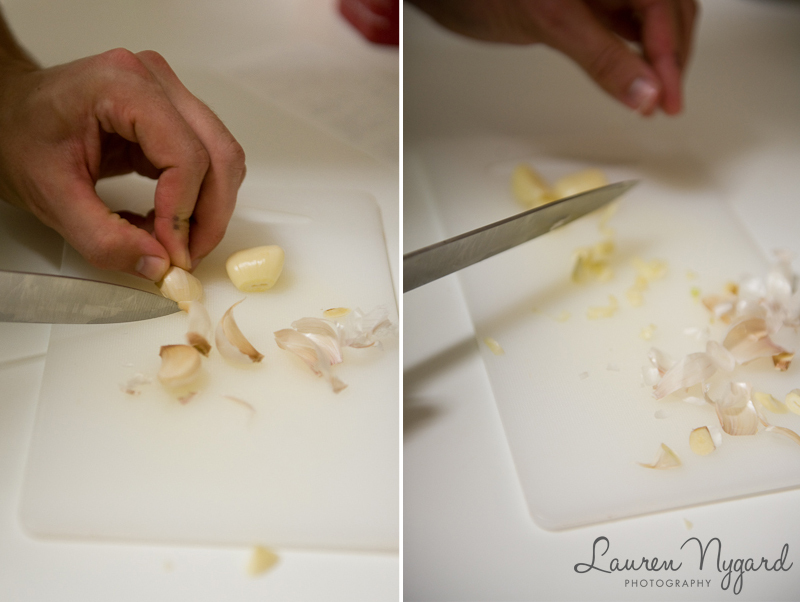 Cook until the garlic is lightly browned (about 2 minutes). Take a look at all the awesomeness you have going on in your kitchen! As the sauce cooks down, let your hubby chop up the bacon into bite-size pieces while you remove the spaghetti squash from the oven and get all those spaghettis out of the squash shell and into your bowls! The above, right photo is about what it looked like when we turned off the stove and started spooning it over the spaghetti squash. 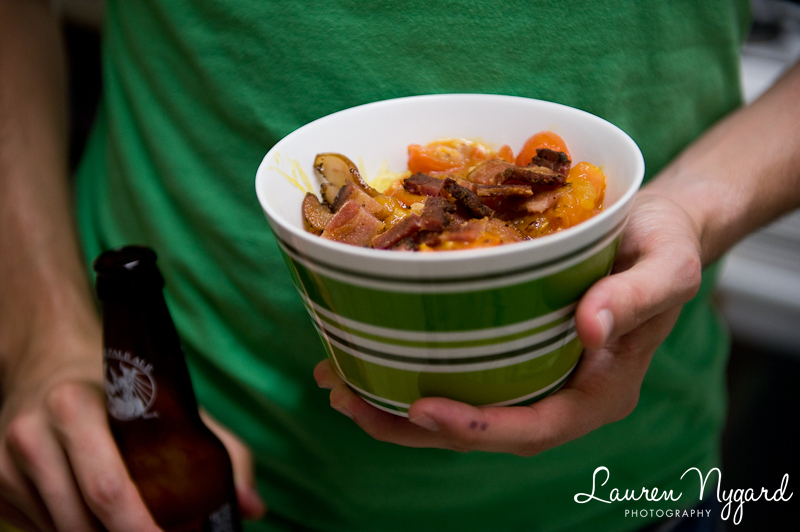 Top with bacon pieces, grab your favorite local brew, sit down, and enjoy! Here’s a condensed version of the recipe. Please click here for the original recipe post on Design Sponge! Adapted from “Pasta with Bacon, Rosemary and Very Ripe Tomatoes” found here. Preheat oven to 350 degrees. 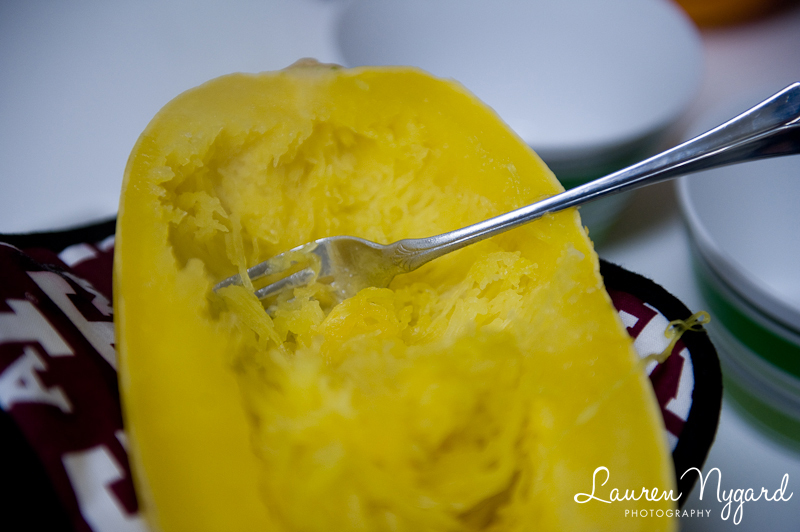 Cut spaghetti squash lengthwise and place (cut-side down) in a baking dish and add about a half-inch of water. Bake for an hour or until the flesh is soft but still a little crunchy. In the last 10 minutes of cooking the squash, add the bacon to the skillet and cook. 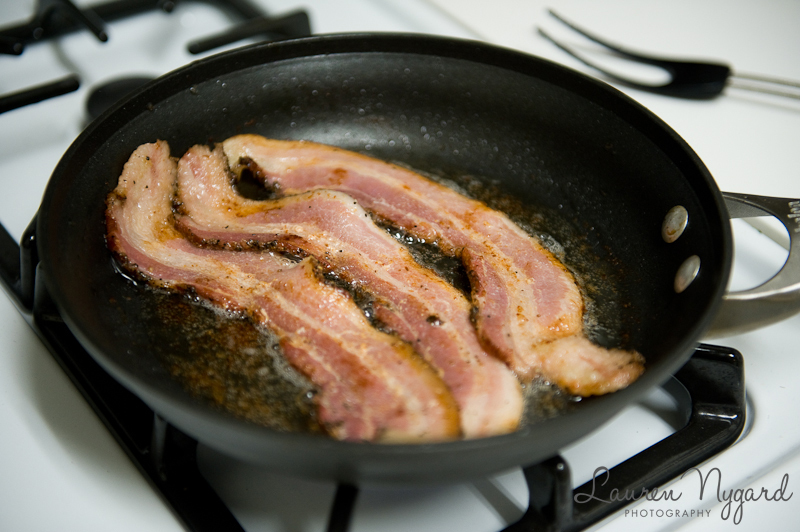 Discard most of the bacon grease, leaving a thin layer in the pan. Add the rosemary, garlic, red pepper flakes, salt and pepper to the skillet. 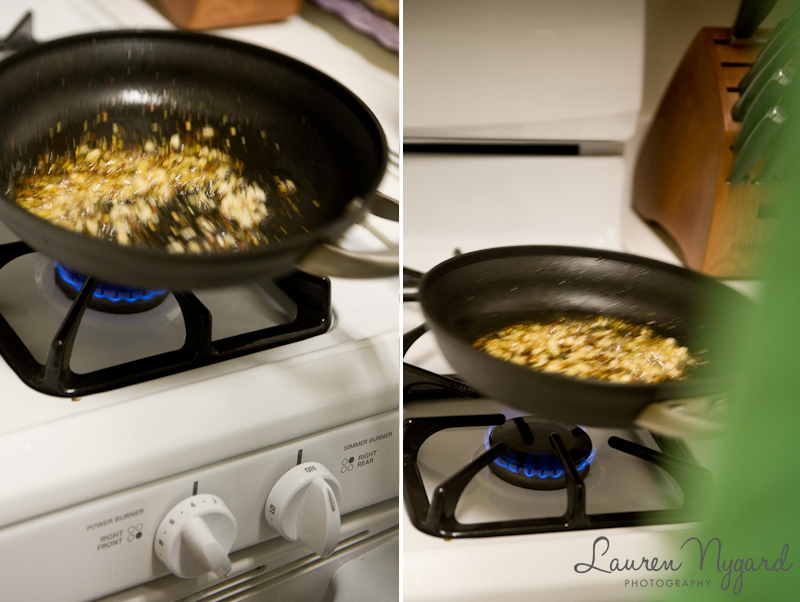 Cook until the garlic is lightly browned (about 2 minutes). 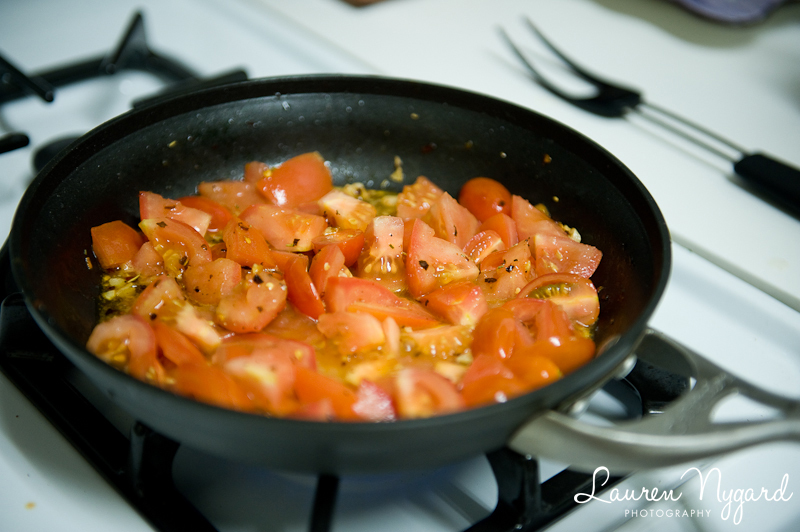 Add the tomatoes and cook for an additional 5-7 minutes. Meanwhile, remove the squash from the oven and scrape out the insides into your serving dishes. 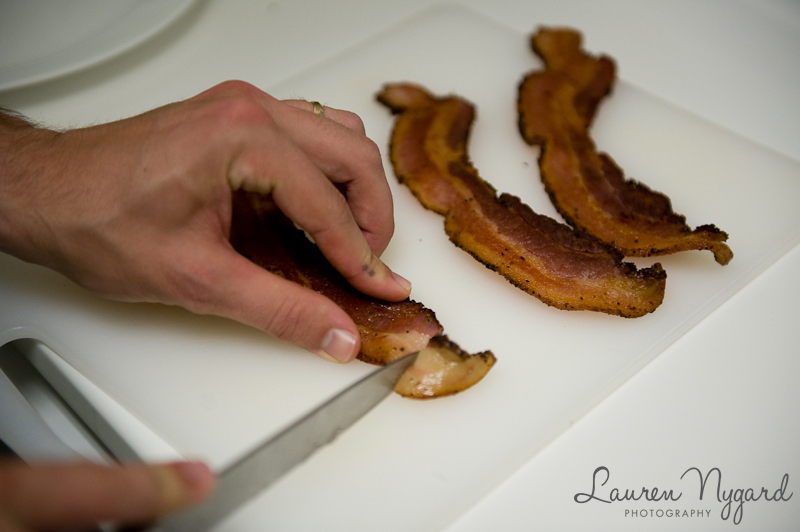 Cut the bacon into bite-size pieces. 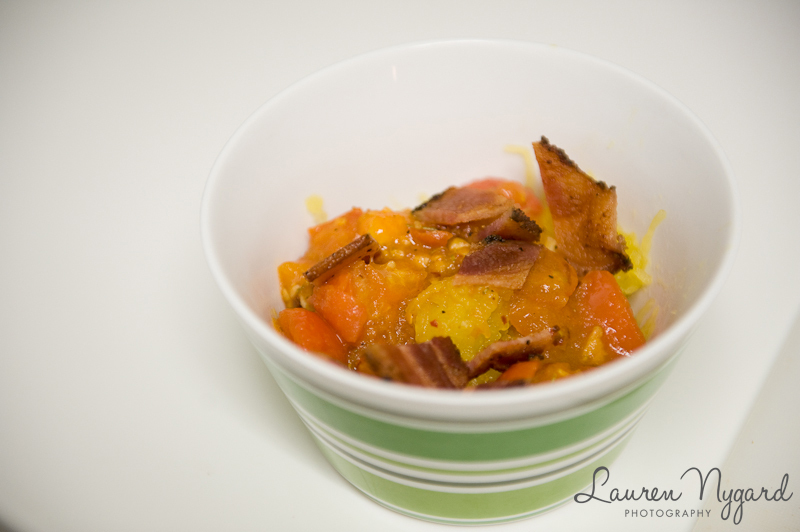 Add sauce to the squash and sprinkle with bacon pieces. Enjoy! Definitely let me know if you make the recipe! I want to know what you thought!! Lauren – Made it last night and LOVED it! I’ve been wanting to try spaghetti squash, but have been a bit intimidated. I just got married and my husband has been definitely a bit…apprehensive…about my healthier cooking, but he, too, really liked it! The only thing I substitued was turkey bacon for regular in order to cut out some fat. Still sooo good!! If you’re in a hurry or just super hungry, you can microwave the spaghetti squash. (15 minutes on high) Just be sure to poke a few holes in the squash so it doesn’t explode. Oh my yumminess!!! This sounds really good. 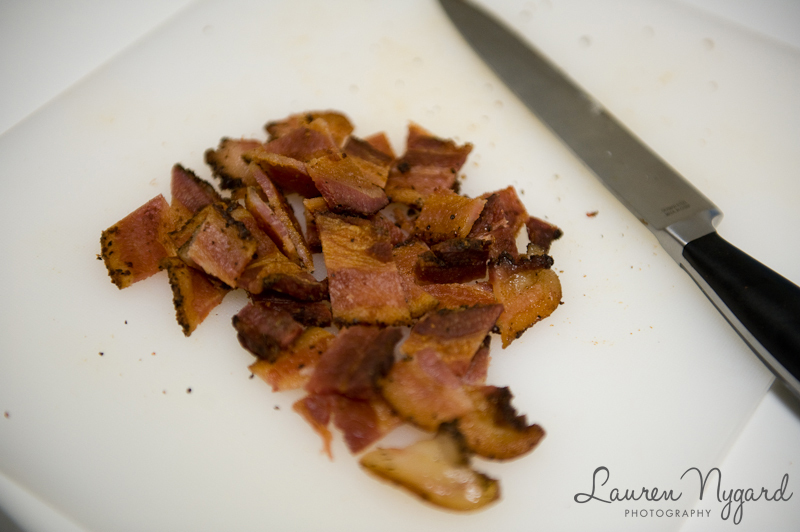 I bet it would be great with pancetta instead of bacon too.